Known by trombonists for his Concerto for Alto Trombone, Johann Georg Albrechtsberger was an Austrian composer and music theorist who taught harmony and counterpoint to Beethoven. 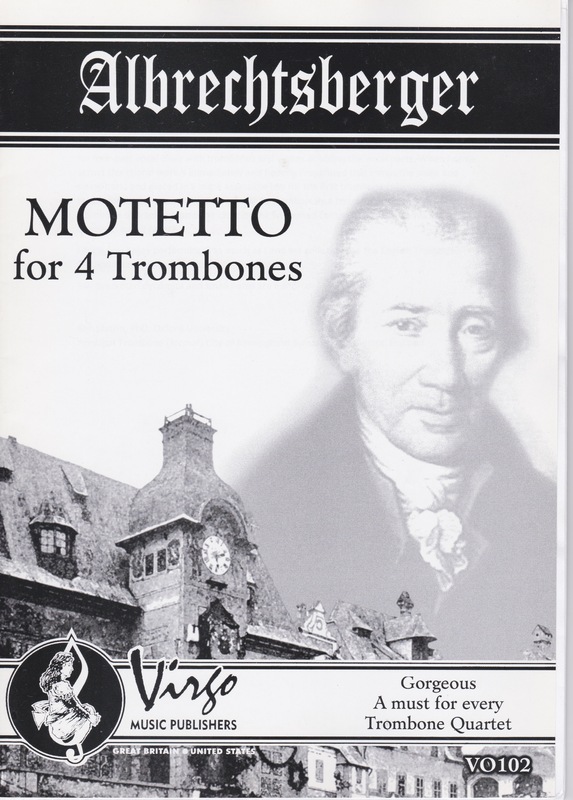 Albrechtsberger’s choral work Motetto was discovered in the archives of the Moravian Music Museum of Brno, also known as the “Janacek Museum.” Ken Shifrin, former Principal Trombone of the City of Birmingham Symphony Orchestra in England, has edited and arranged this work for trombone quartet. Originally scored in C minor for four-part vocal choir with violins and trombones doubling the vocal parts, Shifrin has placed it in the more accessible key of G minor. Marked Adagio, Motetto is 32 measures long, with the optional D.C. nearly doubling the length of the piece to 60 measures. Shifrin includes small notes with the instruction “last time only” giving the D.C. a bit of contrast. Extending up to a high d2, the Trombone 1 part is written in alto clef and can be played on either alto or tenor trombone. The Trombone 2 and Trombone 3 parts are written in tenor clef and the Bass Trombone part is written in bass clef, extending down to c. Shifrin also includes bracketed dynamics in his edition as a performance recommendation. Motetto is a beautiful piece of music written by an esteemed Classical period composer and will serve as a great addition to any college or professional trombone quartet’s repertoire.